As a retail owner, setting up a display for your brand at an event like a market, fair, or festival can be fun — and a ton of work, too. The details of your setup at an event, from the location of your store’s sign all the way down to your product price tags, can make or break your sales at an event if not planned carefully. That’s where visual merchandising can help. Just as you’d use this practice to plan out your retail space, you can also apply these best practices when setting up a table or booth display at an event, whether it’s a festival, trade show, or market. Just think of it as a tiny floor plan, or a bird’s eye view of your brand. With a little effort, planning, and these 10 visual merchandising tips, you can create a smart, engaging display at your next event that will also maximize your sales and bring in new, and potentially regular customers. Before diving into what your display will look like, first consider where you’re setting up. Research the other vendors, events from previous years, and the hosting company or organization to better understand the event’s mission. This will help you come to a conclusion about who your customers will be and why they’re attending. What’s the age range of the demographic? What do you think their income is? What brings them to the event? What hobbies or interests do they have? You can also contact the event organizers to ask for some of the demographic information on attendees. Larger events sometimes have this data readily available for vendors as part of their media kit. With a little preliminary research, you can answer these questions as part of your due diligence prior to sales events. This will help you pinpoint who your customers are for this event, which in return will help determine the items you should display in your booth as it relates to their interests and needs. After you’ve pinpointed the event’s demographics and what their needs and interests look like, it’s time to brainstorm a theme. But first, it’s important to remember one popular visual merchandising tip: Just like your brick-and-mortar store (or online website), your display should tell a coherent story or a visual message. A great place to start is to find a group of colors that work well together. You might already have a palette of colors you regularly work with as part of your branding. If complementary colors first came to mind, you’re certainly not alone. However, there are actually more types of color schemes you can use that might better suit your display. In fact, opposite colors can actually be distracting when used incorrectly. Complementary colors are opposite of each other on the color wheel. This color scheme helps add vibrancy to a focal point. Analogous colors are next to each other on the color wheel. This color scheme helps add warmth and cheer. E.g., Blue, purple, and magenta. Triad colors are evenly spaced around the color wheel, forming a perfect triangle. Like complementary color schemes, triad colors add vibrancy but use the other two colors as accents for balance. E.g., Purple, orange, and green. Tetradic colors use four colors on the color wheel, making a perfect rectangle. This color scheme is very rich, allowing one color to be dominant and creating a balance between cool and warm colors. E.g., Red, orange, green, and blue. To help determine which color scheme to use, begin by thinking about how you want your customers to feel when they walk into your booth. Then, consider how your color theme complements your brand and the products you’ll be showcasing. This will help you pinpoint the visual message that’s best suited for your display. For example: If you sell natural goods, a nature theme is a perfect visual message. Highlight your display with beautiful foliage, fresh flowers, and green, blue, and brown tones. Having a cohesive theme will help your items feel relevant and natural, too. PRO TIP: If it fits within your theme, consider adding fresh flowers. It’s scientifically proven to make people feel comfortable and relaxed. As the next point in the planning stage, you’ll start to put the initial components of your display together. But first thing’s first: Keep things simple, clean, and tidy. Organization generally leads to attractive displays. In the case of displays and booths at event sales, less really is more. Neat and organized displays allow your items (and the product information) to really shine, which means customers won’t be distracted by clutter. Lights create a visual interest, and it helps highlight the focal points in your display’s message. For the items you really want the passersby to notice, try using accent lights to draw their eyes to the product. And if you’re opting to use a display wall or tall shelving, highlight those areas with lights as well, since higher-up items are generally the focal point for customers. FURTHER READING: Need more guidance on creating the perfect lighting? Use our guide to create an ambiance that encourages sales. Now, it’s important to note that not everything can be a focal point in your display. You must be able to create a balance between the attention-grabbing pieces and accent pieces. To do this, remember one of the most common visual merchandising tips: the rule of three. This rule is all about creating symmetry (or balance), based on research that suggests the human eye tends to consider symmetry more attractive. For example, having three items in a row with the middle up a bit higher creates a balance between the three products, allowing the middle product to be the focal point and the two on each side to accent it. In this case, the middle product should be a brighter color or a larger item to help grab attention in key areas of your display. Next, consider the fixtures you want to utilize. While shelving and props will allow for more space to display your products, you want to ensure that you’re not overwhelming your customer with a ton of merchandise. So, use additional fixtures sparingly and effectively to maintain the balance throughout your booth or table. Lastly, don’t forget the signage. A poorly placed sign can ruin your balance instantaneously, so its location needs to be strategic. Ensure that the sign doesn’t disrupt the flow of the booth but also that customers can see it from far away. This one might be a bit obvious, but it’s something a lot of retailers forget when setting up at an event: the price tags. When you’re shopping, what do you think when you pick up an item without a price tag? Probably that it’s very expensive. So, don’t make your customers guess — otherwise, they might think your product is out of their budget. DIY: Creating your own price tags will not only cut back on expenses but also add another creative element to your table. Here’s a simple idea: Create your own with some string, a pretty stamp, a pen, and retail tags. Barcode printers: Available at a variety of price points, barcode printers (or label printers) provide a quick, easy, and professional approach to adding prices to your wares. 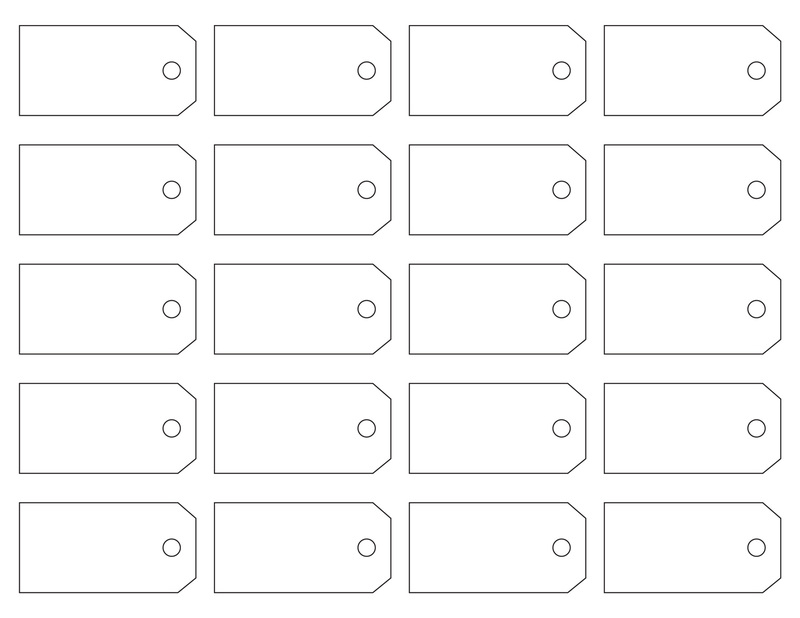 Templates: A quick Google search for price tag templates will lead you to countless options that you can print yourself at home. Labels: If you’re strapped for time or cash, pick up some small labels from a nearby office supply store and neatly handwrite the price yourself. This approach may be simple, but it can still add some personality to your display. Pro tip: If you’re using stickers for your price tags, ensure that they can be easily peeled off so the sticker doesn’t affect your merchandise. With all of the intricacies of visual merchandising, there’s still fun to be had. Adding a spark of creativity in your event booth can help increase customers’ interests in your products, and it can help make the process more exciting for you. It could be as simple as the flickering light from a few candles to add a bit of animation, or a tablet that showcases your business or even lets customers interact with your brand. Now, it’s time to plan it all out — and that’s where a planogram comes in. A planogram is a diagram that pinpoints the placement of retail products in an effort to maximize sales. It’s the perfect visual merchandising tool to help you decide where and how to display your products, not only to support your table’s visual message but also increase your sales at the event. Most include intuitive, well-designed interfaces that are made to optimize your space and sales. SmartDraw and Shelf Logic offer free trials, too. If purchasing software isn’t within your budget, many opt to make their own with pen and paper. There’s good news, too: Since you’re only creating a planogram for an event space, this can actually be pretty easy. All you need is a pencil, piece of paper, ruler, and measuring tape. If you have the dimensions of your booth area or table, draw it out on a piece of paper with the length listed for each side. Physically place the merchandise you want to sell in an open area that mimics the space you’re working with. Play around with different arrangements, keeping your theme and focal points in mind. This will also help you determine if you need any additional tools, like shelving and stands. Once you’ve landed on an arrangement, draw out your items on your planogram to scale, using a half inch for every foot. And, remember to label each one and don’t forget to account for your business’ signage. When you follow these visual merchandising tips, your display items will surely go to a new home quickly. So, you’ll want to come prepared so you can replenish your table’s stock. If you don’t come with additional items, your table or booth could start to look empty. According to Angie Bell, author of “Retail Rebranded: Twenty-Seven Secrets of Market Leaders,” a negative space has a number of undesirable consequences. “Out-of-stock [items] inconvenience your customers and so they are more likely to go to one of your competitors for what they need,” she says. Coming prepared also comes with additional boxes of merchandise. Remember to keep boxes out of sight to prevent looking cluttered and out of the floor space so your customers are able to move around with ease. Lastly, be welcoming to your customers — and remember, you’re not limited to standing behind the table. Instead, step out onto the floor, invite customers in, and strike up a conversation. FURTHER READING: Want more tips on making the most of your event sales? Learn how to nail the in-person selling experience. Visual merchandising isn’t limited to only brick-and-mortar stores. You can also make it work for your business at events like markets, festivals, and even trade shows, no matter the space you’re working with. With these 10 tips, you can create the most engaging display for your business, down to every minor detail.